The creature bait that started it all, the Zoom Brush Hog has tempted big bass from coast to coast for decades and it continues to be the standard-bearer for the creature bait category. Texas Rig with an EWG hook and vary the weight with a slip sinker to keep it slowly fluttering through the strike zone or plummeting into the depths where big bass lurk. 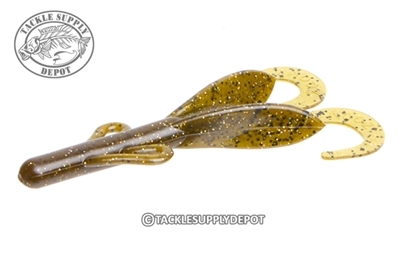 Although the Brush Hog has become a standard to many for flipping cover it has also become a widely used Carolina rigging bait for dragging through the depths. The Zoom Brush Hog may not appear like anything natural food source there is no doubt that bass have been crushing these creature baits for years and will be for years to come.